After looking through all of my scanned photos I have settled on submitting a photo of my husband’s great grandfather, Charles Edwin Garee, and his sister Elda May. The detail in their clothing is intriguing to me. Ed has a suit on and seems to have a pocket watch chain visible. His hair is parted on the side and he is wearing full length pants. Elda looks to be quite young, may be 5 or so, and she has earrings, bracelets, and necklaces on. Her dress looks to be made of heavy fabric with lots of pleats. The chair she is on has a high back that has a landing so that she can sit on it. This chair is in two other photos taken a few years later, though they are a terrible quality. I imagine that the original photo has a photographer’s name on it but I no longer have that information, perhaps I can obtain it later. 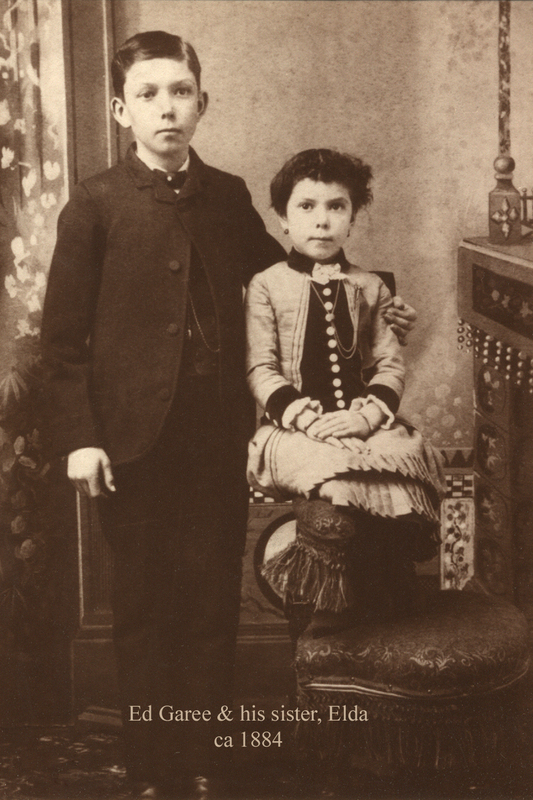 Ed was born in 1873 and Elda in 1879 to Francis Albert Garee and Rebecca Elizabeth Hamilton in Greenwood, Kansas. I’m guessing this photo was taken around 1884. According to Ed’s autobiography they were living in El Dorado Springs, Missouri by 1882 and lived there for 14 years so I imagine that was where this photo was taken. We know quite a bit about Ed, which you can read in his fascinating tales in his autobiography, located on my webpage. Elda, on the other hand we don’t know much about. She married but did not have any children that lived to adulthood. I hope to learn more human interest type of information about the Garee’s and Hamilton’s. Be sure to take a look at all the interesting pictures and stories that were submitted for the 10th edition of “Smile for the camera”. Update: Upon further examination Elda is not wearing necklaces but perhaps a chatelaine. The chain appears to go from her jacket to the collar area. I appreciate this observation noted at Shades of the Departed where the carnival was hosted. Absolutely love this picture. They look like they are the children of a well-to-do family. There are so many grownup qualities to the clothes. Also, I’m intrigued by the chair. Is that a piece of tapestry or perhaps a bellpull laying across it on Elda’s right (actually her left, my right ~~)? I do not believe that the family was well-to-do probably just okay financially. Their father worked as a cheese maker as well as a broom maker. The family did send Ed (I don’t know about Elda) to subscription school for a while that cost $1.00 a month. This would have been in the mid 1880’s. The chair is fascinating and that is the best I can get the photo to see the details. The other photo I have appears to be the same chair but several years later but it is a horrible photo. I cannot tell if that is a tapestry or wall paper near the chair.